Two stories written by students enrolled in Introduction to Journalism at Pattonville High School were recently selected to be published on Best of SNO (School Newspapers Online). Out of the 4,530 submitted stories so far this year, only 816 have been published on the website. Sophomore Imani Warren’s story “What if you were the top of your class?” and sophomore Ava Woods' story “Alumni return to teach at the high school” have been published on Best of SNO. The SNO Network includes 2,372 high school news sites including the Pattonville High School journalism website. Visit PattonvilleTODAY.com to read more stories written by the high school journalism students. 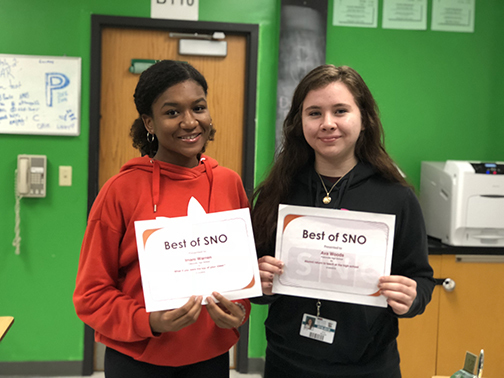 Imani Warren, left, and Ava Woods are shown with certificates after their articles were selected to be highlighted on Best of SNO.